God loves me unconditionally. He loves me because He is Love and not because I am lovely. Yeah, I had a horrible day. The day was so so so bad. In fact it was not palatable at all. I felt like I had probably woken on the wrong side of the bed and maybe as Sara Groves puts it, the wrong side of the world. It was just horrible. Ick. Okay, I’m sure you get the idea. So, I was having this phenomenally bad day, and to make it worse, most of it was my own folly. I had made some terrible decisions and crossed some lines that day. And as I sat on the slab, licking my wounds and battling the tears, I began to get in the ‘sorry me’ mood. You know, the one where you suddenly remember all the things wrong with your life and how you are the innocent victim of life...yadda, yadda, yadda. Yeah, that one. But as I am wont to do, I did not chalk the horribleness of my day to a few bad decisions alone. I dug deeper and realized that all these could be traced to just one bad decision I made that morning or maybe several of those before then. I missed my time with God. Okay, so you may roll your eyes and snort thinking, “And so?” But for me, this was huge (or I want it to be huge. It should be [this is another long post]). And somehow, I began to think that maybe, just maybe God was getting back at me for standing him up too long. Of course, I tried to shake this feeling off immediately it came, saying I knew better. But the suspicion was there. We are like this a lot of times. We believe that God’s love for us is based on our performance. We feel loved when we act well but unloved when we act badly but this is a lie. In fact, it was while we were still dead to God in sin and cared nothing for Him that He demonstrated His love for us (Romans 5:28). It was while we were enemies of God and were wanderers lost in our own folly that He extended a hand of fellowship to us. 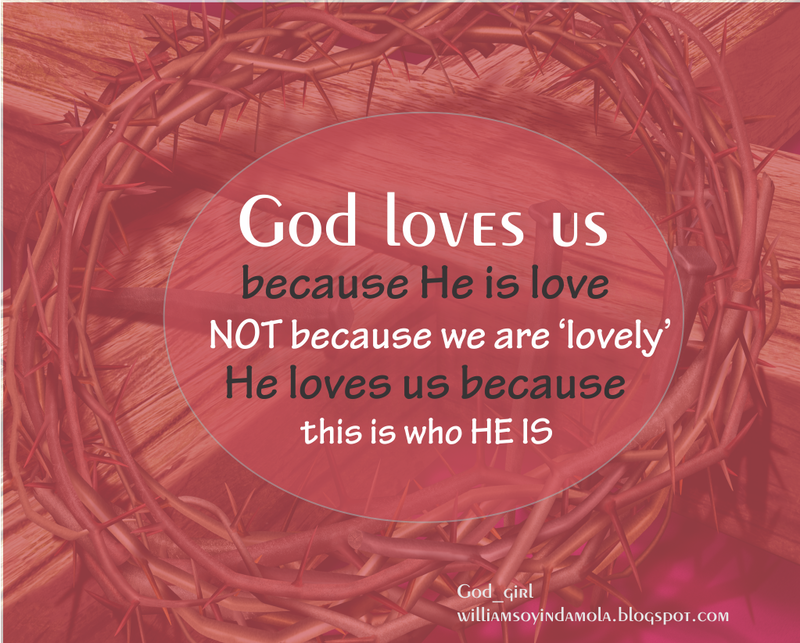 God loves us because He is Love. This is His nature. He cannot help but love. He loves because He is love and not because we are lovely. Nothing we do or don’t do will make Him love us more or less. We cannot coerce Him to love us because we don’t have to. “The one who does not love has not become acquainted with God [does not and never did know Him], for God is love. [He is the originator of love, and it is an enduring attribute of His nature. ]” (1 John 4:8 – Amplified Bible). That’s just the way it is. And of course there are times we do fall short and begin to wonder about whether we deserve to be loved. I know I wonder. But, the truth is we don’t, we don't deserve it and it is in this state that we can truly appreciate the nature of Love. The nature of love is the nature of God. We don’t have to feel loved, all we need is to trust in His word and His profession of love He splatters over the pages of the Bible. “Love suffers long and is kind; love does not envy; love does not parade itself, is not puffed up; does not behave rudely, does not seek its own, is not provoked, thinks no evil; does not rejoice in iniquity, but rejoices in the truth; bears all things, believes all things, hopes all things, endures all things.” (1 Corinthians 13:4-7 – NKJV). Did you get that? Love is patient. God is patient. He is kind, and every other character of love stated above is HIM. Get it? Christ asked us to forgive our brother 7 times 70 times a day. And I believe that if God could ask that of us, then He would at least do the same. He cannot ask of us something He himself has not done or cannot do. So yeah, God is enduring. And all that. The more we understand about this love of God, the more we are propelled to love Him. An active indication of not loving God is that we do NOT understand God’s love. Also, when life comes barelling at us like a raged bull, reflecting on His love keeps us. We struggle with a lot of issues because the love of God is still not real to us. For if we understood, how can we not respond favorably to a One so dear? How? God is love and ALL that He does for us is born out of the love He has for us. It may look unloving to us, but ultimately He is loving us through the process and redefining our perception of what love really is. He is giving us Himself through and through. We may not like the process. We may bend and pass through fire. But faith sits and watches. She waits before the ashes. Again I sit and wonder. I cry in my heart with a desperation that I cannot contain. For if indeed I understood, would I still keep love waiting? Would I continue to gather worthless jewels while He awaits? Will I not pick up my cross and walk the path of love? Will I not be responsive? Reality. Yes, all I need.